Today Zions Bank opens their new Idaho Headquarters in Boise. The top floor will known as the "Founders Room" and will feature Susan Swartz's two new works, Idaho Majesty I and II each 48x85, in addition to the amazing Boise vistas. With daylight savings suddenly behind us, the days of growing darkness are here. The paradox of light and shadow brings necessary balance, and not only in a painting. As an artist, Susan embraces this darkness as a ballast for the brightness of spring. And, she knows that in any season, the natural world offers both beauty and terror, both life and death, both light and dark, all combined in a rich mash. Susan’s most recent, increasingly abstract work will be on display in a new exhibition at London’s Belgravia Gallery, alongside renowned painter Leslie Thiel. While their subjects — landscape and horses, respectively — and their styles — abstract and realist — couldn’t be more distinct, both artists are moved by the natural world and express a fierce tenderness toward the earth’s fragility. Like Susan, Leslie Thiel is an internationally recognized painter, whose large-scale pieces appear in collections throughout the world. Her interest is not in capturing the mere surface of her equine subjects, but in conveying the inner light that emanates from within them. Her painstaking detail and exacting realism are the perfect foil to Susan’s luminous abstract forms. The exhibition opens this week at Belgravia Gallery and tonight, Thursday, October 17, a private viewing will be available from 6 - 8 pm. Interested in attending? RSVP to lorraine@belgraviagallery.com. In addition to her Water Study and Untitled series, Susan has been moving toward abstraction with a third painting series wholly distinct from the others. Now totaling six paintings in all, the Landscape of Resonances series takes the natural world and distills it to its essences: light, heat, form, color. The series title is reminiscent of classical composer, Jeffrey Mumford’s recent composition, Landscape of Interior Resonances, which celebrates the vertical layers of sound within the piano. In a similar manner, Susan explores vertical layers of color in her new painting series. The large-scale compositions in this series are rich and deeply saturated. They’re also highly textural, with one layer of paint reacting to or even commenting on the one that preceded it. The result is a series in which one painting builds on the next, like a progressive commentary on the natural world. The most recent painting in Susan’s abstract Water Study series, Water Study 005 pushes viewers out of their comfort zone and upends the color story we associate with water: clear blues and milky greens. Instead, Susan gives us the opposite end of the color spectrum—hues that could be interpreted as the last coral traces of a peaceful sunset reflected on the ocean, or as a corrosive, clogged and wholly unnatural waterway. The Water Study series rethinks the complex relationship that Susan has with the natural world, both its beauty and its cruelty, both its purity and its pollution at the hands of mankind. In her abstract work like Water Study 005, she develops a visual language that expresses her inspiration taken from natural cues and infuses it with spirit and spontaneity. While Susan has fully embraced abstract painting only for the past few years, there was foreshadowing of a major artistic revolution in some of her earlier work, like Exploding Sky from 2008 or even Calm Day from 2009. Often painting with a palette knife, Susan has long explored the fusion of texture with saturated colors. Each pull of the knife covers or uncovers the color behind it, unveiling discovery or fostering growth. In her Water Study series, what began as an abstract inquiry has exploded into a primary passion, in which Susan interprets the complexities of nature in kaleidoscopic hues. In Water Study 004, dappling reflections and urgent moments describe her keen observations found in the illusions of light. With the coming of a new season, comes a new piece with all the complex depth that Baker spotted in her earlier work. Trees of Gold carries the youthful neon shimmer of spring, but tempered by the reminder that this newness is ephemeral. Susan is an artist who not only sees, but also relishes the contrasts of nature. Perhaps nowhere is this more apparent than in her inspiration itself. For large portions of the year, she paints from her mountaintop studio in Utah, surrounded by the repetitive linear forms of bare aspen trunks and the craggy peaks of the high desert. There’s a sharpness to Susan’s pieces created in the West. During the summer months, however, Susan paints in an entirely distinct landscape—the seaside of Martha’s Vineyard off the coast of Massachusetts. The work she creates here has a softness to it, an almost feminine curve not found in her mountain-inspired pieces. In the last few years, Susan has begun pushing her expressionist style to something increasingly abstract, especially evident in her Water Study series. Like much of Susan’s work, the Water Study paintings—now numbering five—focus on the contrasts found in nature. Its hospitality and hostility are the foundation of her inquiry in Water Study 002, which is both a sweeping view and a close-up observation of the ocean’s idiosyncrasies. With her recent solo show at the Belgravia Gallery, Susan had the pleasure of spending a lot of time in London over the past year. London has many charms, but perhaps Susan’s favorite experience was viewing the Pre-Raphaelite exhibit at the Tate, London. She liked it so much, that she has just revisited these amazing works at the US stop in the exhibition tour at The National Gallery of Art in Washington, DC. Coinciding with the reign of Queen Victoria (roughly 1840-1900), the Pre-Raphaelite art movement was a self-aware, fairly radical group dedicated to overturning artistic orthodoxies. As a whole, this group of artists felt that art in their time had become decadent and instead favored the bright colors and truth to nature found in art before the time of game-changing Italian painter, Raphael (pre-1480s). 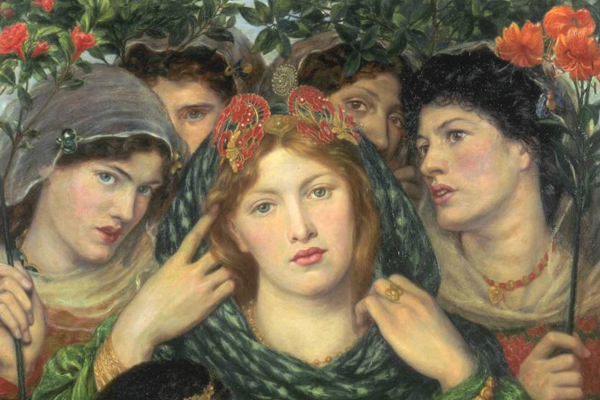 Boldly original in style and conception, the Pre-Raphaelites made a profound contribution on the history of modern art. As a classically trained painter, Susan had certainly been exposed to the Pre-Raphaelites, but the Tate exhibition presented them in a new light, as an avant-garde movement. She was especially moved by the vivid natural imagery that appears in Pre-Raphaelite subjects, and by the art movement’s process of intensely looking at nature, which resulted in a new, distinctively modern style. As Susan’s own painting career evolves into an increasingly abstract style, she has developed her own novel and precise method of transcribing the natural world around her and transmuting her own deeply personal interactions with that world. When her time in London drew to a close, Susan brought home a valuable souvenir: the inspiration of the Pre-Raphaelite’s dramatically original response to nature and the singular intensity of their vision. Susan has imbued her most recent work, like Untitled 020 and the Landscape of Resonances Series, with this same spirit of rule-breaking originality. Missed the exhibit at the Tate or The National Gallery of Art? The Pre-Raphaelites: Victorian Avant Guard will be on display at The Pushkin State Museum of Fine Arts in Moscow from June 10 – September 30, 2013.